The researchers noted that the prevalence of ethnicity selfies (selfies about a person's ethnicity, nationality or country of origin) is an indication that people are proud of their backgrounds. They also found that most selfies are solo pictures, rather than taken with a group. 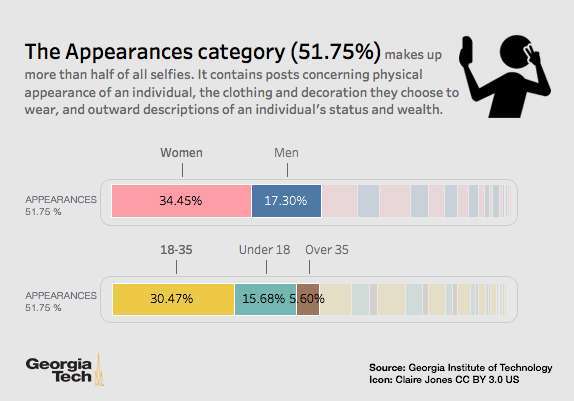 Overall, an overwhelming 57 percent of selfies on Instagram were posted by the 18-35-year-old crowd, something the researchers say isn't too surprising considering the demographics of the social media platform. 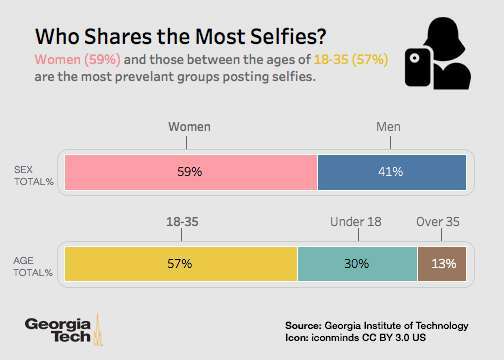 The under-18 age group posted about 30 percent of selfies. The older crowd (35+) shared them far less frequently (13 percent). Appearance was most popular among all age groups. Lead author Julia Deeb-Swihart says selfies are an identity performance - meaning that users carefully craft the way they appear online and that selfies are an extension of that. This is similar to William Shakespeare's famous line: "All the world's a stage, and all the men and women merely players." "Just like on other social media channels, people project an identity that promotes their wealth, health and physical attractiveness," Deeb-Swihart said. "With selfies, we decide how to present ourselves to the audience, and the audience decides how it perceives you." "Selfies, in a sense, are the blending of our online and offline selves," Deeb-Swihart said. "It's a way to prove what is true in your life, or at least what you want people to believe is true." The researchers gathered the data by searching for "#selfie," then used computer vision to confirm that the pictures actually included faces. Nearly half of them didn't. They found plenty of spam with blank images or text. The accounts were using the hashtag to show up in more searches to gain more followers. The study, "Selfie-Presentation in Everyday Life: A Large-scale Characterization of Selfie Contexts on Instagram," was presented in May at the International AAAI Conference on Web and Social Media in Montreal. It looks like after 35 years of age, one is dead? At least not worth an appearance of looking good? We may conclude, as we evolve we get older much younger. What a bummer (just don't get old)! Why wouldn't it be because the older group has more self-confidence and doesn't require (as much) validation from others?